Today I’m loving …. 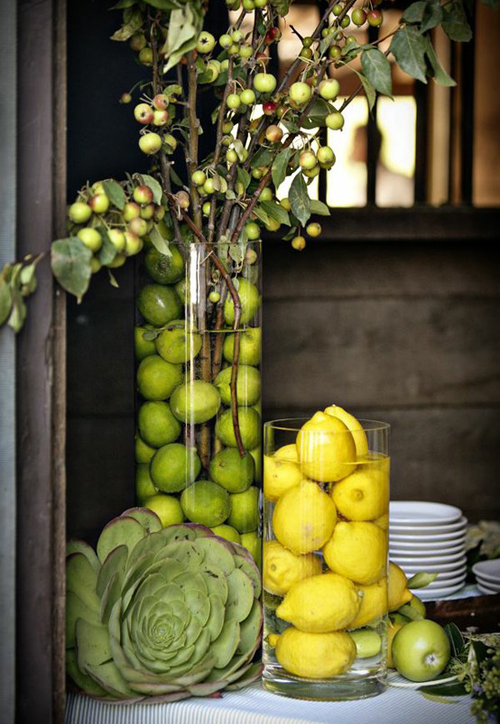 these lemons and limes that function as decoration for a table setting. By the way, the deadline for sending in your entries for the travel files design competition is Friday 27th May (in stead of 25th May). I will then have Saturday and Sunday to go through the designs. I can’t wait to see the designs! Definitely one of my faves too. Almost as good as fresh flowers. Loved the Dutch house in the previous post. Especially the big stencilled letters on the dark wall. Can I ask-how do you get the fruit to sink? I tried to recreate this but my artificial fruit floats. Thanks.